Palikir, Pohnpei, Division of Trade and Investment, Department of R&D: March 25, 2015. The Second Meeting of the Working Group on formation of an integrated market in Asia and the Pacific will take place on March 26-27, 2015 at the United Nations Conference Centre, Bangkok to review and further discuss the diagnosis, findings, and concrete recommendations to improve the current level and quality of market integration in Asia and the Pacific. It is anticipated that the Second Meeting will focus particularly on a number of key issues identified during the First Meeting, including options for an Asian-Pacific agreement, the four markets to be integrated (goods, services, labor, and investment), elements for facilitating market integration in Asia-Pacific (e.g. regional tourism as vehicle for integration and regional education as portals for labor integration), the policy directions for reducing each of the market gaps identified, including direct and indirect policies for consideration by the countries, sub-regional groupings such as the Micronesian Trade and Economic Community (MTEC). The three other Working Groups established under the Bangkok Declaration on Regional Economic Cooperation and Integration, which will also hold their Meetings are connectivity, financial cooperation, and cooperation to address shared vulnerabilities. The final report of the Working Groups will serve as inputs to the Second Regional Economic Cooperation and Integration Ministerial Conference at the end of 2015. The FSM’s involvement in this Working Group is primarily justified by its role as the MTEC Interim Secretariat, which is recognized under the Bangkok Declaration as a one of the sub-regional groupings that contributes to the goal of broader integration of Asia and the Pacific. It is anticipated that through this engagement, the MTEC would raise awareness on its existence, programs and activities, and secure the partnerships that are needed to implement those and achieve its goals and vision. The vision of the MTEC is to establish a community of shared prosperity through the promotion of sub-regional trade and economic cooperation and integration to support the achievement of sustainable and equitable socio-economic development of its Member States and improve the standard and quality of life of their People. The MTEC is considered as a stepping stone toward greater integration of its Members into the global economy. 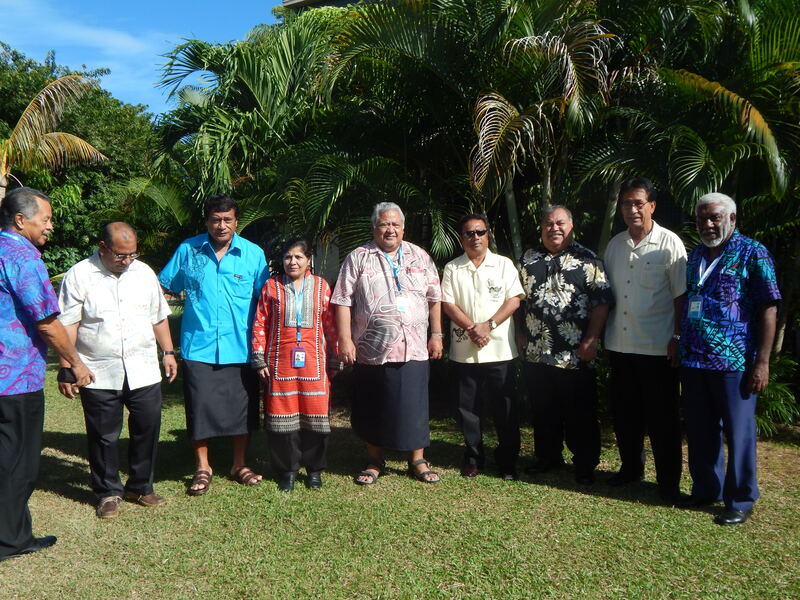 In this regard, the MTEC envisions expanding its membership to other Micronesian Countries (Kiribati and Nauru) and Territories (Guam and the Commonwealth of the Northern Mariana Islands (CNMI)). The FSM Department of Resources and Development is represented in the Working Group on Formation of an Integrated Market in Asia and the Pacific by Mr. Jean Bertrand Azapmo, National Trade Adviser, who will be attending the Meeting. For more information on the Second Meeting of the Working Group on formation of an integrated market in Asia and the Pacific, please contact the Interim Secretariat (FSM Department of Resources and Development), at telephone number (691) 320-5133. 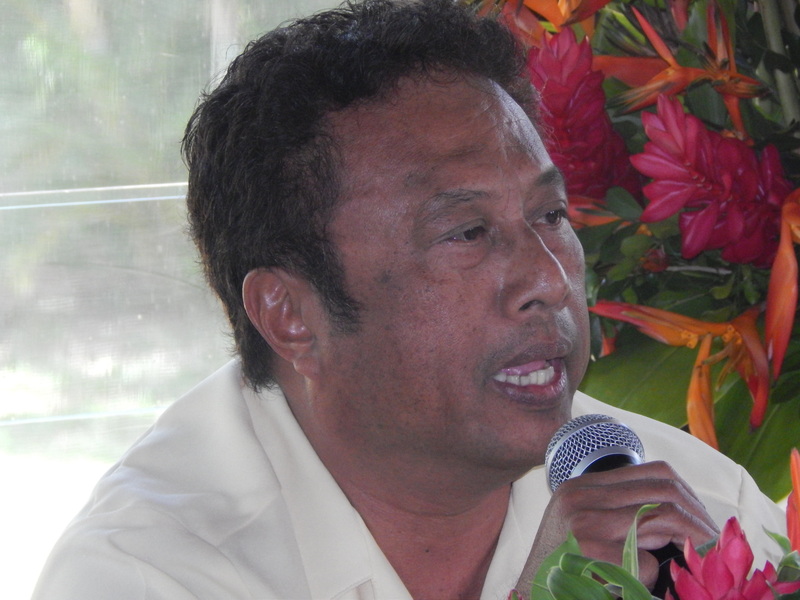 Palikir, Pohnpei, MTEC Interim Secretariat: March 25, 2015. In response to a technical assistance request submitted by the MTEC Interim Secretariat to assist MTEC Member States to conduct an assessment of their trade and investment facilitation regulatory and policy framework, ITC Executive Director Ms. Arancha Gonzalez wrote to Secretary Marion Henry on March 16, 2015 in his capacity as the Interim Secretariat for the MTEC informing him that ITC has acceded the request for technical assistance. Ms. Gonzalez confirmed the ITC through its section on trade facilitation for business has the necessary expertise to assist the three Countries (FSM, RMI, and Palau) to conduct an assessment of their trade policy/regulatory framework for export competitiveness and investment attractiveness. In acknowledging ITC’s positive response, the Honorable Marion Henry, Secretary of the FSM Department of R&D/MTEC Interim Secretariat, expressed MTEC Member Countries’ appreciation and pledged the full collaboration of the MTEC Interim Secretariat and support to work with ITC to achieve the intended outcomes of the assessment. This Project will include a number of deliverables and outputs such as advisory services, public private dialogue sessions on trade and investment facilitation, and capacity building of policy makers/private sectors so as to ensure coherence in the reform process. Other key partners in this exercise include the United Nations Conference on Trade and Development, which will be assessing shipping connectivity in the Micronesian region and its impact on trade and investment facilitation. 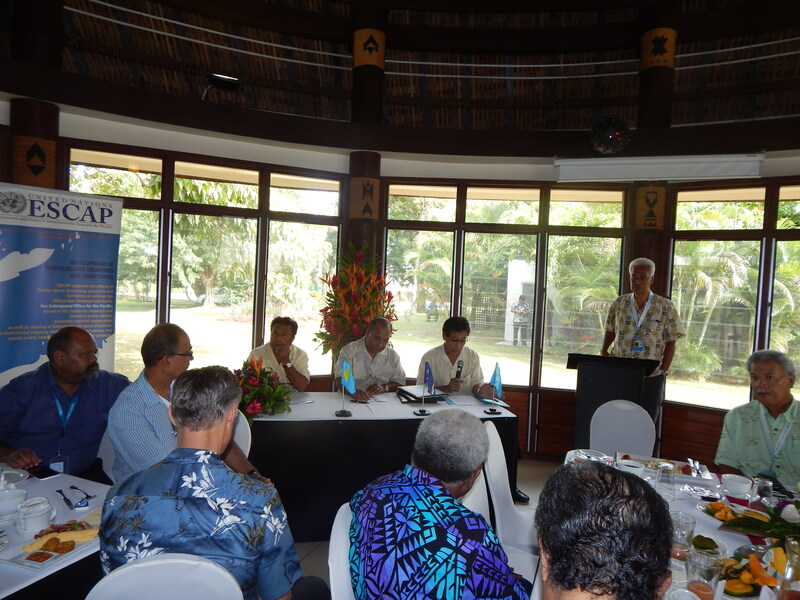 The assessment of MTEC trade and investment facilitation needs and conditions is identified under the 2015-2019 MTEC Work Program, as one of the top priorities to facilitate the establishing of rules, institutions, and infrastructure to facilitate trade and investment between the Micronesian Countries and between the Micronesian Region and the rest of the world. ITC and the MTEC Interim Secretariat supported by the Hub & Spokes II Programme under the Commonwealth Secretariat will start working on the details to undertake this very important exercise, which is scheduled to take place in July 2015. For more information on the assessment of MTEC Member States trade and investment facilitation conditions and needs, please contact the Interim Secretariat (FSM Department of Resources and Development), at telephone number (691) 320-5133. On September 3, 2014, the Presidents Emmanuel Mori of the Federated States of Micronesia (FSM), Christopher Loeak of the Republic of the Marshall Islands, and Tommy Remengesau Jr. of the Republic of Palau, officially formalized their historical trade and economic bonds by signing the Treaty establishing the Micronesian Trade and Economic Community. The signing took place in the margins of the 3rd International Conference on Small Island Developing States, during a consultative breakfast Meeting between Pacific Islands Countries’ Leaders and Dr. Shamshad Akhtar, Under-Secretary-General of the United Nations and Executive Secretary of ESCAP. In their statements following the signing, the three Presidents emphasized the historical importance of the signing event. H.E. 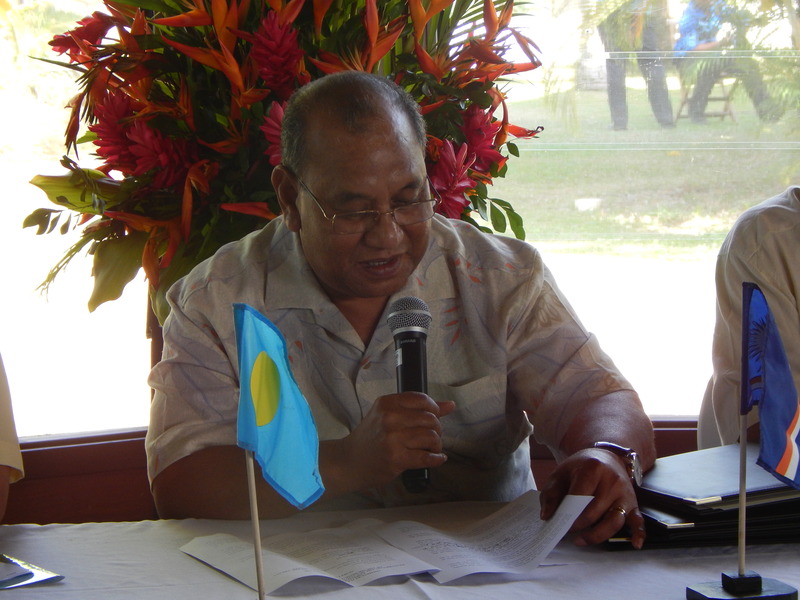 Emanuel Mori, President of the Federated States of Micronesia, underscored the significance of the Treaty and characterized it as a “true reflection of the Micronesian spirit of collaboration which characterized the relations between the three entities.” He indicated that the Treaty provides the appropriate institutional framework through which small producers of the three countries could network and meet the demands of the domestic and international markets, in particular for agriculture, aquaculture, and tourism products. Furthermore, President Mori noted that there were provisions in the Treaty allowing the sisters Republics of Kiribati, Nauru, and the Territories of Guam and Commonwealth of Northern Mariana Islands to join at a later stage. Taking the example of the copra industry, which collapsed in Palau 20 years ago, H.E. Tommy Remengesau Jr., stressed that through sub-regional trade and economic cooperation and integration pursued under the treaty, it would be possible for productive sector to consolidate the volume of the products available, and thus increase the raw material available to support the development of small industries. The signing of the Treaty establishing the Micronesian Trade and Economic Community was attended by the Prime Minister of Samoa and President of the 3rd International Conference on SIDS, Tuilaepa Sailele Malielegaoi, as well as Presidents and Prime Ministers of the Cook Island, Kiribati, Nauru, Tonga, Vanuatu and Tuvalu. For more information on the signing of the treaty establishing the Micronesian Trade and Economic Community, please contact the Interim Secretariat (FSM Department of Resources and Development), at telephone number (691) 320-5133. Sea cucumber, the Pacific Islands second most important commercial fishery and the longest surviving export commodity is facing intense exploitation pressure. Before tuna fishing was realized in the middle of the last century, Pacific islanders were processing beche-de-mer for sale to merchant ships visiting the Islands. Sea cucumber and beche-de-mer, its dried form, is highly priced food item in China the main consumer of global production. But not only this, medicinal properties in sea cucumber has been known in China for years, yet its only recently that modern interest has been attracted to look into its pharmaceutical properties. High demand and lucrative price paid but also weak fishery management controls are to blame for the spiralling decline of sea cucumber worldwide. Here in the FSM Sea cucumbers are not only an exportable commodity, some species such as sandfish (Loangon), Brown curryfish (Werer), and Dragonrfish (Koid) are eaten and sold for an income as in Pohnpei. Most sea cucumbers are found in shallow waters and almost immobile and so easy to see and collect by fishermen. Besides they make a much easier species to study. Yet, they have been accorded much less attention as to those given to other species such as finfish, sharks, turtles, corals or MPAs. Many species remain unknown to science; for example one commercially important species (Hairy greyfish – Actinopyga sp) present only in Yap, Palau and recently recorded in Pohnpei is yet to be identified. Limited knowledge is complicated by the variation in the naming system (trade, scientific and local names) used, where they live and the best way to assess them. Without underwater information, catch and export information are important however these are rarely collected. The challenge for Pacific island fisheries agencies is simply lack of stronger management and monitoring system which stems from limited knowledge of these species, the same situation being faced by other FSM States. Over the last three weeks, SPC is assisting Pohnpei State and the National Government to begin the process of developing an improved and transparent system for managing and monitoring the fishery, and enabling the State and residents to derive maximise economic benefit from their resource. Beginning with this process, a team of surveyors from the FSM Dept. 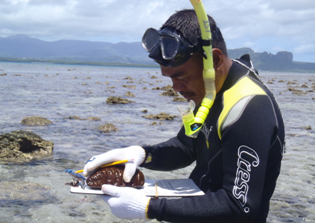 of R&D, OFA, EPA, CSP and Fish and Wildlife led by Kalo Pakoa, SPC’s Invertebrate Fisheries Scientist completed surveys around Pohnpei proper. Commercial fishing here in Pohnpei, Yap and Kosrae are closed for up to 10 years now. FSM, like a few other protected fisheries in the Pacific are the target for commercial interest especially traders who will do whatever it takes to get supplies. Shortage of sea cucumber worldwide has created escalating demand for these products, and as 70% of the Pacific Fisheries are closed, you can see why traders will not overlook the FSM Islands. So prior to any decision to go fishing, proper systems need to be established first. Resources assessments intend to determine resource health and whether stocks can support sustainable harvest. Trained officers will take the same surveys to other islands in the State who are affected by the same system of management. At the meeting held on Friday 28 June at the WCPFC conference room, concern stakeholders learn of the critical state of sea cucumber fisheries in the Pacific, and especially what is happening in the FSM regarding aquaculture and ranching of sea cucumber and as well the preliminary results of the surveys in Pohnpei. While some species show signs of recovery, one species; Sandfish (Holothuria scabra) or Langon as is known locally seems to be in trouble. Interestingly record of Hairy greyfish – Actinopyga sp, now extend the natural distribution of this species to Pohnpei beside Yap and Palau. The stakeholders with these facts discussed and proposed useful ideas to be incorporated into measures in the new Plan. Amongst ideas put forward, stakeholders felt this industry is old and about time it be fully localized, while good idea, the risk of closing down opportunity of benefiting from competitive price from foreign investors is a risk. License for export, permit for exports, and MCS were proposed as government revenue avenues and as tool to gather catch and export information. Permanent closure and short opening season is the approach and, only species prescribed will be allowed to be fished in an open season by area. Species specific quota by area and for each open season, and minimum harvest size limits by species were proposed. Stakeholders agree with the need for measures to increase resources rent to the government and opted to use the same system of auctioning of license to the best bidder. SPC will continue to work with the National government and Pohnpei State to get the plan to completion. A nearshore fish aggregating device (FAD) is an anchored or drifting object that is placed in the ocean to attract fish.1 Tuna and other pelagic fish gather around a FAD, making it easier to find and catch them. Nearshore FADs are deployed to improve the efficiency of small-scale fishers, but are also thought to provide other ben­efits, such as reducing fishing pressure on reefs, and providing a means to adapt to the predicted effects of climate change. In addition to the six FADs supplied under the CCCPIR project, SPC provided Yap State with sufficient materials to fabricate an additional six FADs in case some of the primary FADs were lost. • the increasing local demand for fresh fish. Four municipalities with access to the six FADs were selected to help implement a newly designed FAD moni­toring programme5 to collect data over a five-month period with the primary objective of gaining an under-standing of their effectiveness. The preliminary results of the monitoring programme are presented below. 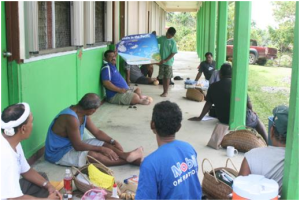 The monitoring programme consisted of interview-based, fisheries-dependent surveys, including fishing vessel counts and catch and effort interviews, and a household calendar survey that collected information on a household’s daily fishing activities, fish consump­tion and sales. In total, 660 fishing trips were reported over the sampling period, and assuming that 100% of fishing trip coverage is reported, this amounts to an estimate of 1,496 fishing trips per year across all sampling sites (Table 1). This is likely to be an underestimate, but these are nonetheless used in the extrapolation of total effort estimates in the economic analysis presented thereafter. 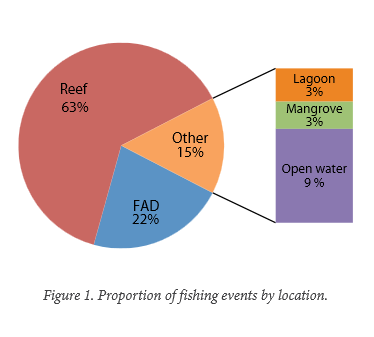 About 63% of fishing events6 by location occurred on the reef over the sampling period (80% of total reported effort – hours), with FADs making up 22% of fishing events by location (10% of total reported effort – hours) and open water, mangrove and lagoon fishing making up the remainder (Fig. 1). 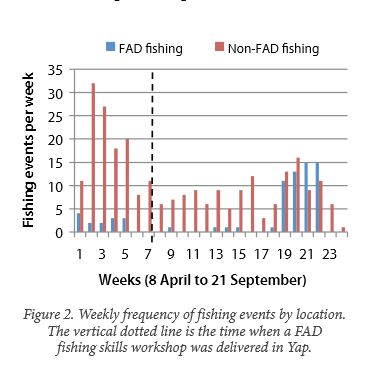 Figure 2 presents the weekly frequency of fishing events (n = 336) by fishing location, simply disaggregated as FAD fishing and non-FAD fishing7 (660 trips were recorded through the vessel count, but only 245 catch­and-effort interviews were conducted, related to 336 fishing events). Although there is no clear trend, there is a notable increase in FAD fishing effort in August and September (weeks 19–22 in Fig. 2). Catch and catch rates8 are ana-lysed below, but the time series is too short to provide an indication of whether this effort increase is seasonal, a lagged effect of the FAD fishing training, an indication that the FADs had reached “maturity”, or other depend-ent or independent factors. Additional data will improve the understanding of fishing behaviour and trends. There is a strong correlation between fishing effort (loca­tion) and catch category, hence total reported catch is dominated by reef fish (Fig. 3). 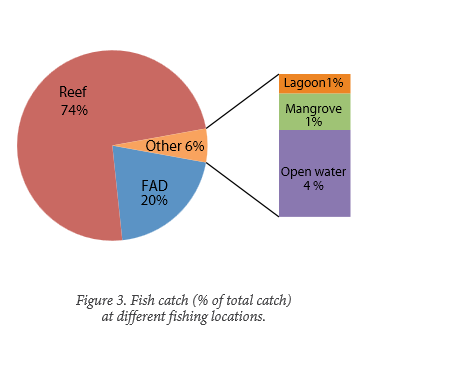 However, FAD catch rep-resents 20% of the total reported catch of 13,900 kg, when fishing effort at FADs only represents 10% of the total effort of 1,127 hours recorded over the sampling period. This is due to the high catch rates obtained at FADs (~25 kg h-1 boat-1) (Fig. 4), followed by open water and reef locations (each with ~12 kg h-1 boat-1). Catch per unit of effort (CPUE) is averaged over the whole sampling period and average non-FAD CPUE was ~12 kg h-1 boat-1, which is used in the with-and-without analysis below. Given that fish are typically priced and sold by weight, CPUE (kg h-1 boat-1) is the logical proxy applied in the economic analysis. In total, 131 household completed the calendar-based questionnaires over three periods of four weeks each. Collectively, the calendar data amounted to 3,668 days, with 13 data units produced per household per day. 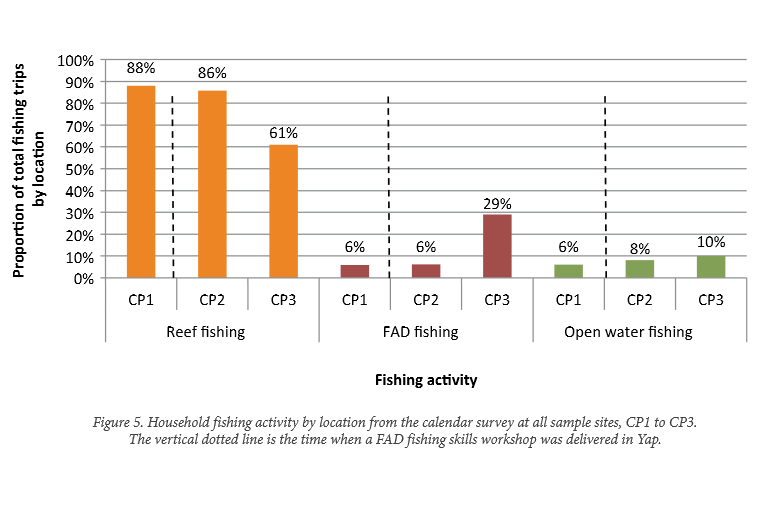 Figure 5 presents the results of the household fish­ing activity for calendar periods 1 to 3 (CP1 to CP3). The data indicate that households across all three sites go fishing ~40% of days, or 2.8 days per week. In CP1 and CP2, fishing occurs on the reef 86–88% of the time, while FAD and open water fishing (non-FAD) occurred between 6% and 8% of the time. In CP3, the proportion of fishing trips occurring on the reef declined to 61% while FAD fishing markedly increased to 29%; these results correspond to those presented in Figure 1, con-firming the robust nature of the monitoring programme and similarly, the time series is too short to make infer-ence about fishing trends. Corresponding to the change in fishing location, analy-sis of the household calendar data revealed that there was a change in fish consumption (reef fish being con-sumed 84% of the time in CP1 and CP2, declining to 70% in CP3) and sales (reef fish being sold 85% of the time in CP1 and CP2, declining to 55% in CP3). The fisheries-dependent and household socioeconomic data were collated to inform a mid-term economic analysis (consisting of “with-and-without”, “cost–benefit” and “what-if ” analysis) of the FAD project in Yap. The change in the value of catch resulting from increased catch rates at FADs is estimated in order to determine the financial benefit of FADs in increasing small-scale fisher efficiency. This is done by taking the hours fished at FADs and applying an average non-FAD catch rate (Fig.4) to compare the value of production with and without FADs. Assuming that, in the absence of FADs, fishing effort (hours) dedicated to FADs is applied to non-FAD locations, the difference between the value of the catch with and without FADs amounts to the financial benefit of the increased fisher efficiency resulting from FADs. 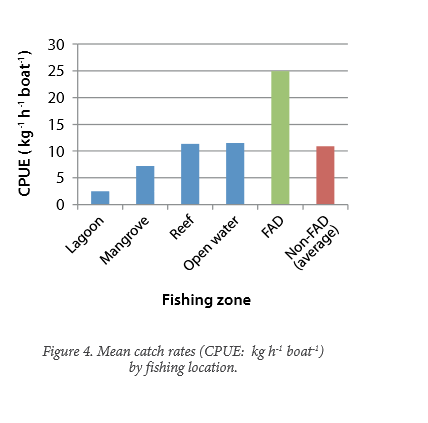 This is modeled under three scenarios using the FAD and non-FAD (average) CPUEs (kg hr-1 boat-1) presented in Figure 4. The scenarios are: actual reported fishing effort at FADs over the five-month monitoring period, and extrapolated9 fishing effort for five-month and oneyear periods (Table 2). 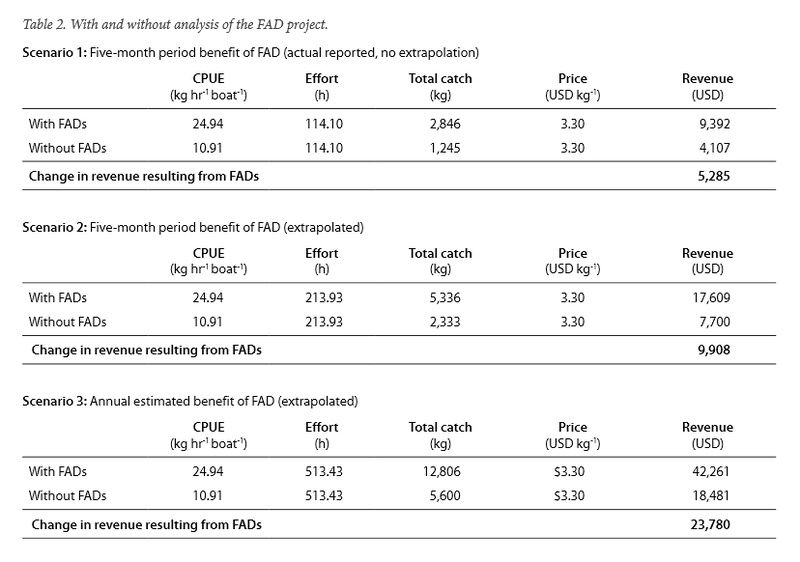 Table 2 demonstrates that the actual change in revenue to the fishing community resulting from increased catch rates at FADs after five months was ~USD 5,285, and when extrapolating, this amounts to ~USD 9,908 over the five-month sampling period. Over a year, this is esti-mated to increase catch value by ~USD 23,780 to the fishing community in the sample sites. In calculating the economic return from the project, the project cost was approximately USD 20,000, with capac-ity building and monitoring costs treated as sunk10. Accounting for the project cost and the benefits (cash inflow) presented in the with-and-without analysis (Table 2), and applying a 10% discount rate, the project generated a positive economic return (NPV) within a year; over a two-year period, it is estimated to have gen­erated a net economic benefit of ~USD 21,272 (Table 3). That is, after investment costs for FAD materials and deployment are stripped out, the economic benefit amounts to USD 22,272, or an internal rate of return (IRR) of 84%. This financial benefit omits other direct and indirect benefit of FADs, such as reduced fishing pressure on reefs, which leads to improved ecosystem services and climate change adaptation, which should be considered in a comprehensive cost-benefit analysis. Figures 2 and 5 demonstrate that FAD fishing effort increased in the latter months of the monitoring period and from this, it can be inferred that fishing effort trans-fer occurred from non-FAD to FAD fishing locations11 Considering this, we conduct a what-if analysis to pre-dict the financial benefit derived from increased fishing effort and catch rates at FADs should this trend of effort transfer continue. This is done by modelling three effort transfer scenarios where it is hypothesised that fishing effort at non-FAD locations is transferred to FAD loca­tions with FAD catch rates applied. For the three scenar-ios 25%, 50% and 75% of total non-FAD effort transfer are modelled. Under these scenarios and assuming that catch rates and fish price remain steady, 25%, 50% and 75% effort transfer from non-FAD to FAD fishing locations would increase revenue to the fishing community by USD 50,065 (24% increase in revenue), USD 100,130 (47% increase) and USD 150,195 (71% increase) over a one-year period, respectively. Considering the trends presented in Figures 2 and 5, it is reasonable to assume that scenario 2 (50% effort trans-fer) is a likely scenario when hypothesising fishing effort transfer. Therefore, over the life of the FAD project (two years), it is estimated that effort transfer and increased catch rates at FADs may increase revenue to the fishing community by approximately USD 200,260 (47%). The interim results of the fisheries-dependent monitor- ing programme and household survey are indicative that both boat-based fishers and Yapese households utilise coastal areas (reefs, lagoons and mangroves) as their primary fishing grounds and source of food and income. This, in itself, demonstrates the importance for improved coastal fisheries management to build resilient coastal ecosystems under a scenario of climate change. It also demonstrates the need to provide alter- native opportunities for Yapese fishing communities to continue their traditional fishing ways in anticipation of declining coastal fisheries productivity. FADs improve fisher efficiency, in terms of increas­ing catch rates. FADs may encourage household behavioural changes, in terms of diverting fishing activity away from the coast, and in changing fish consumption and sales from reef fish to pelagic fish that are typi­cally associated with FADs. The financial cost incurred from procuring and installing FADs is significantly outweighed by the additional catch values generated. If fishing effort continues to be transferred from the reefs, lagoons, mangroves to open water area, catches and associated revenue to fishing communities will increase. The above conclusions are not definitive due to the short time series and it is, therefore, recommended that the monitoring activity be extended for a longer period. Numerous stakeholders have been involved in the Cop-ing with Climate Change in the Pacific Islands Region project and their contribution is gratefully acknowledged; however for the FAD monitoring component of the pro­ject, the contributions of the following individuals are greatly acknowledged and appreciated: the five data col-lectors Joseph Waayan, John Gamou, Joe Lukangaw, Paul Gorong, and John Yangruw; the fishers and households in the municipalities of Rumung, Maap, Gagill and West Fanif who provided their valuable data; Yap Commu­nity Action Programmeme (YapCAP), especially Julian Tewasilpiy, who administered the data collection pro-gramme; Yap’s Marine Resources Management Division of the Department of Resources and Development, espe­cially Mr James Pong, who oversaw the data collection programme; the New Zealand Aid Agency (NZAID) who funded the data collection; the German Agency for Inter-national Cooperation (GIZ), especially Fenno Brunken; and the Secretariat of the Pacific Community (SPC), especially Etuati Ropeti, Michel Blanc, William Sokimi and the Data Management Team. impacts of climate change, which are expected to add to the already existing local threats to man­groves, coral reefs, sea grasses, and inter-tidal flats, resulting in declines in the quality and area of all habitats. Projections show progressive decline in productivity of all components of coastal fisheries. 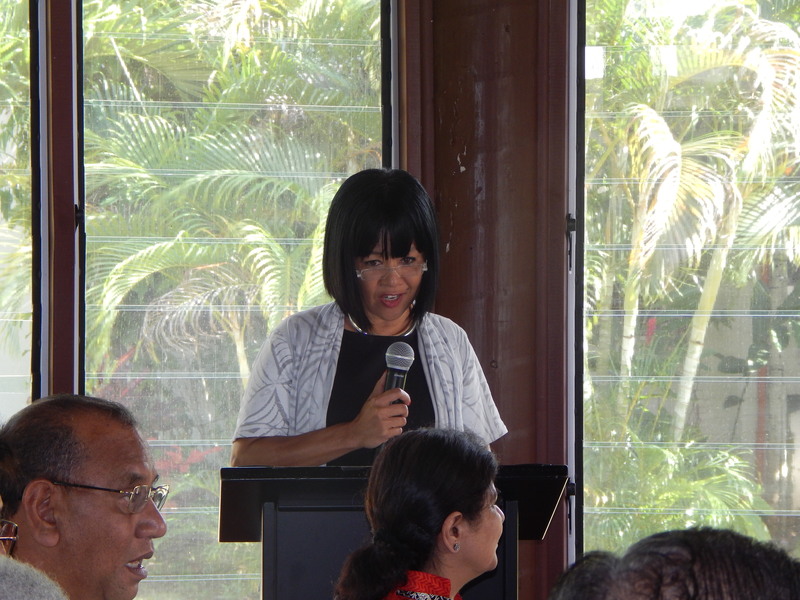 To address this prob­lem, national and state governments, municipalities, and island communities implemented a CEAFM pro­gramme with technical assistance from the Secretariat of the Pacific Community (SPC) and in partnership with non-governmental organisations. Since mid-2012, the regional SPC/GIZ1 programme Coping with Climate Change in the Pacific Island Region (CCCPIR) has been supporting CEAFM with the aim of improving community awareness on cli­mate change impacts and assisting communities in maximising opportunities to adapt to social, economic and environmental effects of climate change. This will strengthen the capacity of local communities to respond to climate change impacts through the appli­cation of integrated coastal resource management, conservation and adaptation. Thus, the resilience of marine ecosystems will be improved, as well as the live­lihoods of people depending on them. 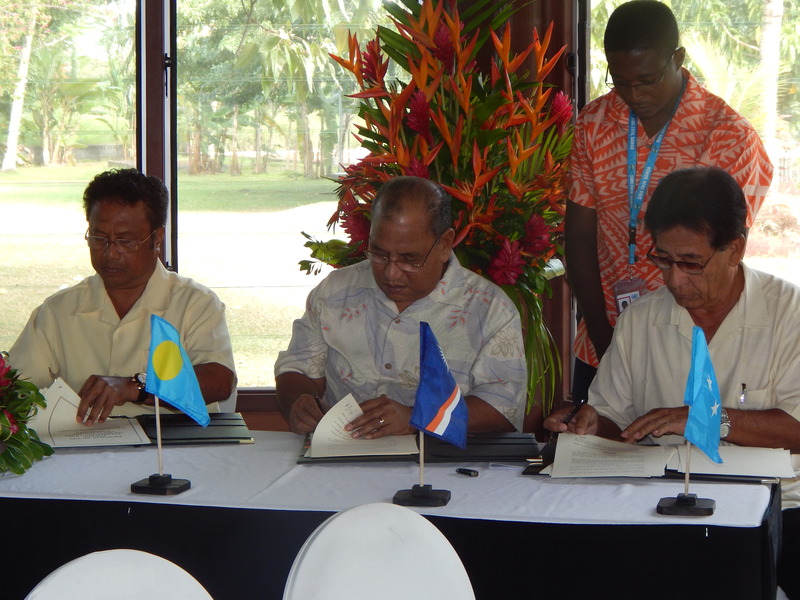 Under the supervision of the FSM national government, the State of Yap was chosen to begin the project. Three communities in the state were selected as pilot sites: Riken/Wanyan, West Fanif, and Rumung Island. stockpiling materials for repair, maintenance and new deployments. Capacity building is being undertaken through training attachments for state counterparts at SPC headquar­ters on resource management planning processes and monitoring. State-wide awareness campaigns/climate change open day. Official launch by national and state government, partners and communities. Capacity building for FSM national researchers to conduct resource monitoring and scientific observa­tions in all states. for value adding and to extend shelf life of catches. 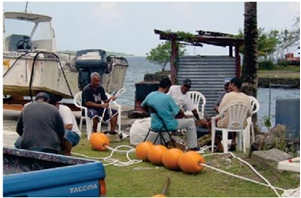 Nearshore anchored fish aggregating device (FAD) programmes are being implemented widely through­out the Pacific. Numerous agencies are involved and FADs are deployed with a wide array of overarching objectives, including climate change adaptation, reef conservation, securing food and livelihoods for Pacific Islanders. The primary objective of FAD deployment, however, is universal: to improve the efficiency of small-scale fishers in targeting tuna and other pelagic fish. The effectiveness of FADs in achieving this objective is confirmed when talking with fishers; however few data are available in support of this. The collection of data surrounding small-scale, diversified and geographically dispersed fisheries is generally problematic, so SPC and development partners are trialling a new approach to monitor FAD programmes. The FAD sampling design is currently being trialled in Yap State in the Federated States of Micronesia, and there are plans to replicate this in other locations in 2013. The data collection methodology involves com­munities and fishers who are beneficiaries of FADs, and selects data collectors from each site to champion the monitoring process. 1) FAD deployment registry – records details (loca­tion, FAD type, rigging components, cost and main­tenance) of every FAD that is deployed. These data, when linked to catch data, can facilitate optimisation of FAD programme design, including best locations, depths and rigging. 2)Fishing vessel identification – identifies and col­lects information on all active fishing vessels (name, owner, type, general catch and effort information, and safety equipment ownership) mainly to establish indices of fishing effort. 3)Fishing activity log – counts the number of fish­ing trips, by vessel type, returning to a pre-selected landing site over a series of random periods. These data form the basis for estimating total fishing trips from a landing site — indices of effort — which, in combination with trip-level catch data, allows for an estimation of total catch. 4)Catch and effort log sheet – general trip-level data are collected, including financial data, while fishing effort and catch data are collected by fishing event (i.e. location and fishing method), which allows disaggregation of catch and effort data by location (i.e. at and away from FADs). These data allow us to understand the effect that FADs have on the effi­ciency of fishers’ fishing activities (i.e. catch rate and fuel consumption). 5)Household fishing, consumption and sales calen­dar – a daily household survey that is implemented before and after FAD deployment for at least two peri­ods of four weeks. The survey, which is completed by households in beneficiary sites, collects data daily on household fishing activity by location (e.g. reef and lagoon, FAD, open water), fish consumption by fish category (reef and pelagic), and fish sales by category (reef and pelagic). The calendar helps indicate how effective the FADs are in achieving secondary objec­tives, such as transferring fishing effort from the reef to pelagic fisheries and increasing income generated from the sale of tuna. The FAD sampling design is based on the regional arti­sanal tuna fisheries monitoring programme that is being implemented in a number of countries, and the data col­lected will help inform the management of small-scale fisheries. Six nearshore, subsurface FADs were deployed in Yap State in the Federated States of Micronesia in February and March 2013. 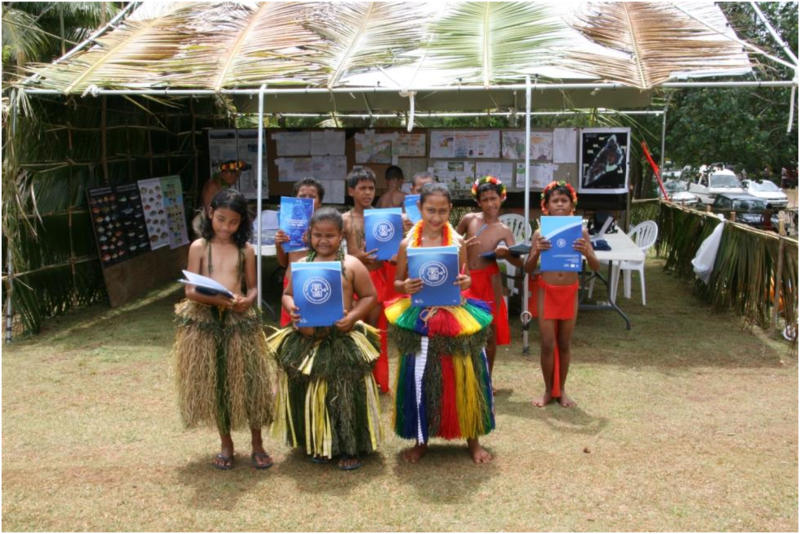 The FADs were deployed as a component of the project “Coping with Climate Change in the Pacific Islands Region”, which is funded by the German government and implemented by SPC and the German Agency for International Cooperation. Local partners in this project include Yap’s Marine Resources Management Division of the Department of Resources and Development, and the non­governmental organisation Yap Community Action Program. Four landing sites have been selected for implementing the FAD monitoring framework and five data collectors have been hired to facilitate data collection. The results of this exciting inter-agency project will be reported on once sufficient data become available. The Governor also handed over the community fisheries management plans prepared with three participating communities since the project inception two years ago. To support the participating communities with managing their fisheries resources, the project conducted training programs for community representatives on rigging, deploying and maintenance of Fish Aggregation Devices (FADs), fishing gear and methodology around FADs, as well as community consultations culminating in the development and production of community fisheries management plans. Additionally, the project deployed 6 nearshore FADs as alternative to support management undertakings by the participating communities..
On Friday afternoon the Yap-Day committee also presented the winners of a poster competition on the topic “Climate Change, Fisheries and Communities”. 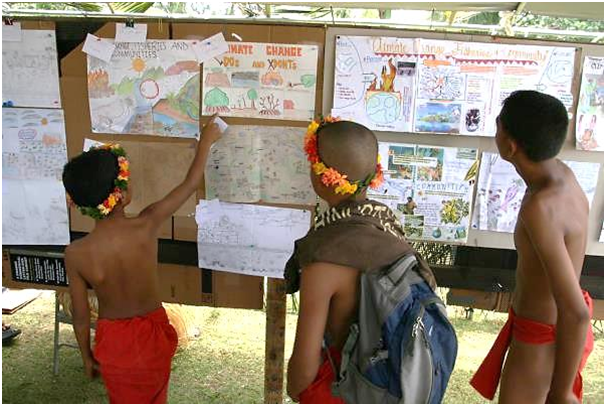 More than 200 students from 10 Yapese schools from 1st to 12th grade participated in their posters competitions. Some 35 winners in several categories were announced and received prices from 10 to 100 USD. 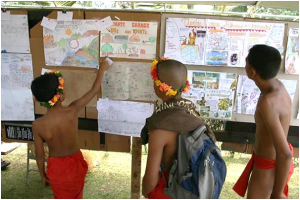 The winning posters were made available for public viewing as part of the Yap Day display by the Marine Recourses Management Department (MRMD) where some 500 visitors also received information on climate change adaptation and the management of coastal marine resources in Yap. Pacific Island countries (PICs) are among those most vulnerable to climate change impacts, and there is an urgent need to progress adaptation and mitigation measures in the region. Climate change impacts such as changing rainfall patterns, more extreme floods and drought, seasonal changes, increased cyclone intensity, ocean acidification and rising sea level are likely to affect all communities in PICs. Recent surveys conducted on the status of coastal fisheries resources in FSM revealed a dramatic decline with fisheries resources. This has raised grave concern for the national and state governments, the municipalities and the island communities. To address this problem, the national government with technical assistance from SPC and NGO partners supported communities to implement a community-based ecosystem approach to fisheries management (CEAFM) program. CEAFM represents a combination of fisheries management, ecosystem management and community-based management. CEAFM is therefore the management of fisheries, within an ecosystem context, by local communities working with government and other partners. CEAFM through community participation aims at improving community awareness on adverse impacts of climate change to assist in maximizing opportunities for communities to adapt to social, economic and environmental changes. This will strengthen the capacity of local communities to respond to climate change impacts through the application of integrated coastal management and conservation based adaptation measures to improve resilience of marine ecosystems and the livelihoods of people depending on them. Strengthening of community leadership and governance. Stockpiling materials for repair, maintenance and new FAD deployments. In addition capacity building is being undertaken through training attachments for state counterparts at SPC headquarters on resource management planning processes and monitoring. Vulnerability and adaptation assessments for selected communities. With the launching on Friday, February 28, 2014 the project was officially handed over to the Yap State Government where MRMD will spearhead community work and full implementation of the management plans. SPC,GIZ and FSM national government continues to provide technical support for the project. The FSM Department of Resources and Development launches its official website.